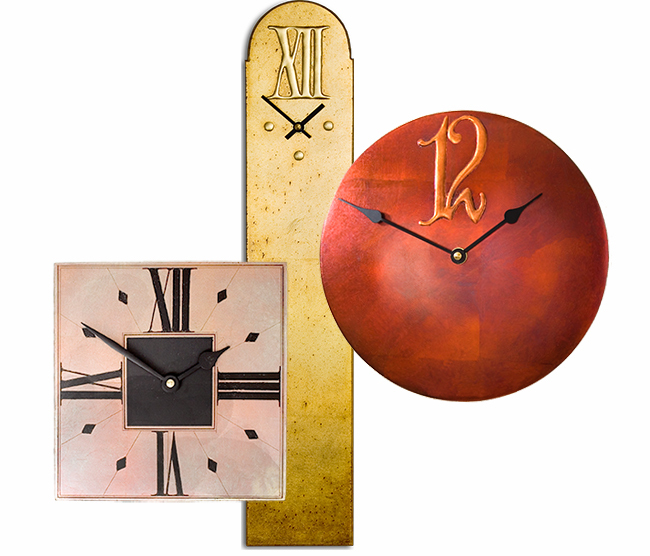 The Contemporary Wall Clock Collection. Imagine a contemporary wall clock with a finish that captures the iridescent beauty of a butterfly's wing and offers a whole new spectrum of colours that stimulates the eye and fire the imagination. Unique reflective qualities cause the colour, tone and mood of the wall clock to subtly change, according to the ambient light and the angle it is viewed from, constantly presenting new facets of the finish. As handmade clocks we can customise the size and finish to meet your tastes, so if you would prefer a more conventional gold clock or a specific paint finished clock then we can oblige. 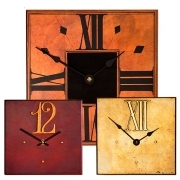 Rectangular, square, round and wall clocks. To show these exciting finishes off to best advantage we have used pure geometric forms, comprising of angular planes, so the light plays off their surfaces enhancing these iridescent qualities. To add contrast and detail to the finishes of the mantle and rectangular clocks we offer a choice of six different dials. 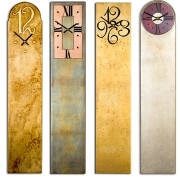 These range from Roman numerals for the more traditional clock designs and for a more contemporary clock look we offer a simple four bar dial or etched Arab numerals. Click on one of the above mantle or rectangular clocks and see for yourself. The right size wall clocks for you. 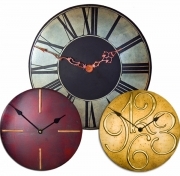 We are able to offer our contemporary wall clocks in a range of sizes. If you need one making to a specific size than we'll happily oblige….with a handmade clock there's no need to make do! To find out the different sizes that our contemporary wall clocks come in simply click on the image of the type of clock you're interested in and then on the clock of your choice. You'll also be able to see more detailed pictures giving you a better idea of the quality of our gilded clock finishes.